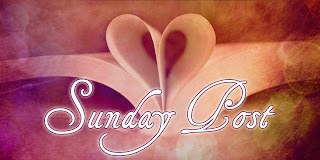 The Sunday post is a weekly meme hosted by Kimba the Caffinated Book Reviewer~ It's a chance to share new~A post to recap the past week on your blog, showcase books and things we have recieved and share news about what is coming up on our blog for the week ahead. Big thank you to Sarah at The Book Life for telling me about the tour and sending me a copy! Also.. she was totally sneaky.. She slipped bookmarks in between pages! She knows my addiction to bookmarks so well lol. well. not me. But a Blurb from my review of The Hunt!!!!!!!!!!!!!!!! I can't tell you all how excited this made me. I used to dream of it. I would read quotes from authors and newspapers ect.. in books and think.. THAT is what I want to do. This was back in high school and middle school before I even knew about book blogging! I never knew book bloggers could have blurbs in books.. Then I joined the blogging community and met everyone. And as much as I continued to dream that I would see my blogs name in a book.. this still came as a huge surprise ! So thank you to all of you. If you didn't stay with me and my blog.. maybe I wouldn't have reviewed that book, and this dream wouldn't have come true. See that fancy new Meme banner at the top ? :) That's a hint at what's to come! I got a new design and can't wait to share it with you all! It should be live in a few days, and I will be having a giveaway to celebrate! So keep your eyes peeled and visit back! I can't wait to see your new design, especially since the banner looks great! I was so tempted to request Poison but then I saw it was Disney, I always thought they didn't accept blogger requests? I love bookmarks as well and I'm hunting down some more frames to put the rest of my swag in. Congrats on the quote and I hope you enjoy your week Michelle! Being quoted in a book is the best feeling. Very nice haul. I hope you love everything. I personally didn't like the Hunt, but Prey has a really cool cover. Come visit me as well. Great books and swag. I am looking forward to reading The Hollowed Ones. Congrats on the quote! *ugly noises* You have Dualed!! And Poison looks pretty cool. I like the cover, though it reminds me of Kristen Stewart on the book edition of Snow White and the Huntsman. And I'm so happy to see you quoted in a book! I haven't read The Hunt, but I've been told I need to read it. Great haul! I am excited for Dualed too. ooh, I can't wait to see the new design. Nice haul. Happy reading. Congratulations on being quoted! That is so cool. Poison and Dualed look really good. I hope you enjoy all the books !